Ryan had to work today again. After Robbie and I were up and dressed and had played some, we went out for breakfast and had pancakes and then we headed into Watertown to go to the White’s Lumber Home Show. We got some neat free stuff – a bag and hat and water bottle from White’s, another hat, a little keychain thing, and some other stuff. We walked around the whole place about 6 times, just trying to kill time as Spongebob Squarepants was coming at noon. They were doing pictures with him – free even!! – and Robbie was all excited when he saw him. So we waited in line for the picture, and when we got to the front of the line, Spongebob was scary all of a sudden. So no picture, but maybe next time. When we got home Robbie had the rest of his pancake and sausage for lunch – he barely touched it at breakfast, so I took it with. While he was napping I got caught up on newspapers and even stitched some and watched some Wheel of Fortunes and a Triathlon that I had Tivoed. When Robbie woke up, we went outside and played for probably an hour or so and then we had supper – from the freezer to the microwave to the table. LOL Then we played and had bathtime and then bedtime. Ryan had to work late as they had to tear down after the Home Show was over, and then he went out with the guys for a little bit (he did call me to let me know, so it was ok). I stitched and watched some TV this evening after he got home. Yesterday was just another day. Went for a short run (like 1.1 miles short) for PT. Had a seated music rehearsal – yes, we actually played music – all morning, and after lunch was the class that was supposed to be on Wednesday but the lady coming to teach it was unable to make it. Then I had a van appointment for an oil change. Went and picked Robbie up from daycare when I was done at the car place, and then it was home to play outside until Ryan got home from work. He made mac & cheese for supper. Today we had a ceremony at Syracuse University – the ROTC Chancellor’s Review. It was a nice bus ride there – after the stop so a certain female SSG could go back in the van (it was behind the bus – with the big instruments) and get her uniform PANTS. How does one forget their pants for their uniform? This certain SSG simply amazes me – and yes, I’ve talked about her before. *shaking my head* Why are people like her in *my* Army? Anyways, I got a lot of stitching done on the bus ride to Syracuse. When we got there, we did a short rehearsal in the dome so we could kind of get the feel of the astro-turf. Then we went to another building for lunch where we got pizza. It was GOOD pizza, too! And they had bags of goodies for us – t-shirts and water bottles. I like doing gigs like that. Then we had quite a bit of time before we had to be ready to go, so I sat in our changing area (the Home Coaches locker room – the guys were in the Home Team locker room) and stitched more. About 20 minutes before we had formation I finally changed into uniform (we traveled in civvies) and headed out. The ceremony went well – LOTS of awards for the ROTC students, both Army and Air Force. It lasted about an hour and then it was change back into civvies and head home. I stitched again on my way home. I had arranged for Beth to pick Robbie up from daycare, so once we got back to the bandhall, I headed over to her house to get my little guy. Then, since Ryan was working at the Home Show for work, Robbie and I stopped at McDonald’s for supper and then home to play outside until bedtime. I’m sure enjoying this nice weather we’ve been having!! The Brass Quintet (E Team) did our diagnostic PT test this morning. I did 41 pushups (89%), 70 situps (87%), and ran my 2 miles in 20:06 (63%). My total score was 239. My run was SLOW, but at least it was passing. I was happy with how I did considering the lack of PT I’ve done AND being sick for the last week. Our record test is on 20 April, and I’ll be fine for that. After morning formation, the 2 guys from the School of Music that were here yesterday to do a “Lessons Learned” brief (stuff we learned (both positives and negatives) while we were deployed) came back to summarize everything. After they were done, I did some stuff in Ops and then stitched over my lunch hour. After lunch we had drill band (marching band) at one of the gyms on post – to get ready for our ceremony on Friday. All the fields are still either under snow or under water or MUD, so we went indoors. It was small in there, but we managed to get the basic stuff done that we needed to do. Once we were done with that, I headed into Watertown and finally got my t-shirt I won from Froggy 97 the end of last month. Then I stopped at the grocery store on my way home, and once home I got a good quiet shower. Ryan and Robbie got home soon after I was done and we played until suppertime – mac & cheese and pigs in a blanket. We all had orange juice (Robbie’s favorite juice right now) to drink. Then we played some more and then Robbie wanted to take a bath so we did that. He’s in bed now and I’m heading off to do some crocheting. Before I leave, though, I’ll share my recent cross stitch finishes. . .
A fun day with my son! Ryan had to work today, so Robbie and I had a Mommy/Son day. We both slept in and then had toast with peanut butter on it for breakfast. He had juice and I had milk. Then we walked to the Post Office. He was very good and held my hand the whole way there and back, and even carried one of the pieces of mail. When we got home, we played outside until lunchtime, and after lunch, boy was he ready for a nap. It’s amazing what fresh air and exercise will do! While he was sleeping, I got caught up on my newspapers and watched quite a few of my Wheel of Fortunes that I have on Tivo. Ryan got home from work before Robbie got up. Once he was up, we played for a while and then went to the Golden Unicorn for supper and then home to play and do bathtime. After he was in bed, I stitched and watched TV. I still wasn’t feeling super good this morning although a little better. I had to go to PT and I just did some stretching and a few leg lifts. My head was still “in a vice.” Before lunch we cleaned our buildings and grounds really good as we’re having some visitors from the School of Music on Monday. They were going to cut us loose at lunch time, but mid-morning we got a call from our Battalion and were informed that we had to be at Battalion at 1500 for a formation. Yay fun. NOT! So I stitched through my lunch hour and part of the afternoon while “sitting around waiting for the bell to ring.” Formation time finally came around so we headed over there and listened to the BN Commander blah-blah-blah-blah about stuff – most of which didn’t really pertain to the band and the rest we already knew. I gave a couple of guys from the unit a ride home. They carpool together, but today both of their wives had their cars. 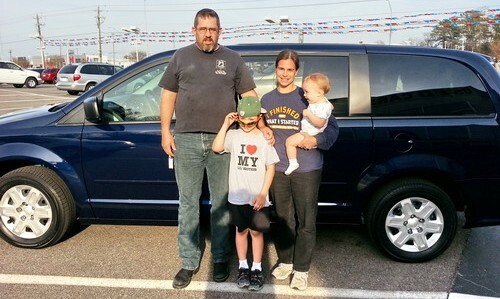 I’m glad we’re a 2-car family (although we have NO cars, but a van and truck. . .). I picked Robbie up on my way home and we came home and played until Ryan got home. I had put supper in the crockpot this morning – Crockpot Chicken Experiment. After Ryan had joined in the fun for a while, we ate the chicken and potatoes I had done with my secret made-up sauce and it was actually pretty good! After supper we played some more and then cleaned up and Robbie headed to bed. We watched TV and I stitched. Monday was a long day. We drove from Rick’s through Canada and home to NY. The weather was awful in the morning – actually not too bad at Rick’s and then it just kept getting worse. We stopped for a potty break and to switch drivers about an hour or so from Toronto and it started clearing up a little. By the time we stopped to eat about an hour past Toronto it had changed to rain instead of snow. We ate at Wendy’s for lunch, got gas, and were back on the road. We got home a little after 6 and that included a stop at the grocery store. It sure was good to be back home again, and our kitties were glad to see us. Tuesday was back to work for me and Ryan and back to school for Robbie. It was finally warm enough to go for a run for PT – still cold, but at least not below zero. We ran 2 miles (a 1 mile loop twice) and during the second mile it started to really snow and was windy. I was glad when we were done. We had our first Brass Quintet rehearsal in the morning and then after lunch I did some stuff on the computer in the Ops office. Wednesday morning at PT I did pushups and situps and stretched good – I was sore from the run Tuesday. I spent the rest of the day being miserable. I did dig out a few old job sheets that we were looking for and wrote the calendar on the board in the Ops office. Other than I was useless – my head felt like it was in a vice, my throat hurt, I blew my nose more times than I care to remember. I headed home about 2 and went right to bed. Robbie woke me up when they got home. Supper was in the crockpot so that was one less thing that I had to worry about. I did play with Robbie for a while, and then after we ate I took a LONG hot shower. That helped a little bit but I was still miserable. This morning I went to sick call and I have an upper respiratory infection. The doc put me on quarters today so I could go home and sleep instead of going to work. I stopped by the band hall and gave my quarters slip to my platoon sergeant and then headed home. I did have to go back to post, though, as I couldn’t go to the pharmacy to get my meds until after 8:30. So I went back and got my meds – antibiotic, cough syrup, sudafed, throat lozenges, and motrin (Army candy as we call it – you get motrin for just about everything). I came home, got drugged up, ate a little bit, and went to bed. I slept from about 10-3. I felt a little better when I woke up and I read a few newspapers and watched some Wheel of Fortunes. When Ryan & Robbie got home, we played for a little while before I made sloppy joes for supper. Then it was clean up time and bedtime. I crocheted and we watched some TV.